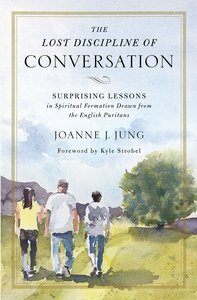 In The Lost Discipline of Conversation, spiritual formation professor and author Joanne Jung walks readers through the Puritan practice of "conference," or focused, spiritual conversations intended to promote ongoing transformation. An antidote to privatized faith, conference calls believers to biblical literacy and soul care in a context of transparency and accountability. About "The Lost Discipline of Conversation: Surprising Lessons in Spiritual Formation Drawn From the English Puritans"